Product review sites are great and all, but they usually don’t allow you to ask the specific questions that are on your mind, and they almost never show you social info: what do friends own? So a buddy and I built a site that does that. It’s fundamentally Q&A format and it bends over for Facebook if you want it to. 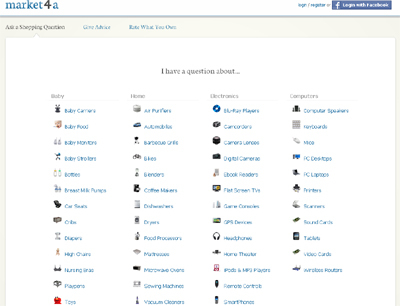 You can use it to get recommendations, ask technical questions, or just poll friends to find out what they know. Nothing like this really exists. This isn’t just vanilla Q&A. We integrate deeply with Facebook and orient the questions all around models.